PAGE supports our program through advocacy, staffing planned events, working with the teachers to provide assistance in the classroom and coordinating fund raising efforts. 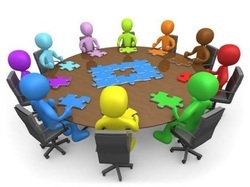 Our PAGE group meets each the 2nd Monday of each month in the Exploratorium at McKinley elementary. The next meeting will be held on Monday, October 12th at 5:30 in Room 311. We will be discussing upcoming events as well as setting a regularly scheduled time to meet. Come and lend your great ideas to our program! ​t-shirt to be sold that academic school year. The instructions/contest rules are listed on the flyer below that is being sent home with each student the first week in October. 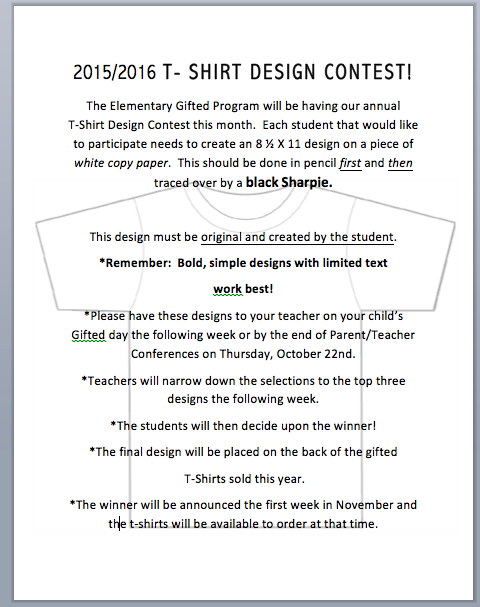 As in years past, the Elementary Gifted logo with Einstein's face inside of a lightbulb is featured on the front, while the winning contest entry is featured on the back of the shirt. T-shirt/sweatshirt sales follow the contest, with the orders being delivered to each student's home school before the Winter holiday season begins. We hope to have a lot of contest entries to choose from! !